Today I found out about John Billington, the first convicted murderer in America. John Billington was around 40 years old when he disembarked the Mayflower in New England in November, 1620. 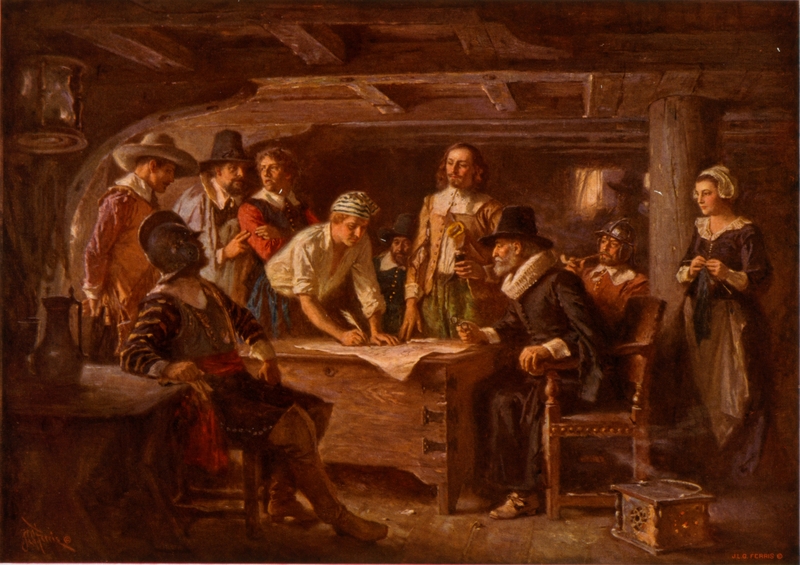 Like most of the other adult males on the ship, he had signed the Mayflower Compact prior to setting foot on American soil. The Compact had been drawn up to preserve peace in the new colonies, and those who signed it promised “all due submission and obedience” for the “general good of the colony.” Many of the signers grumbled and complained about putting their names on the document and more or less putting themselves under Puritan rule, and it’s thought that John Billington was probably one of them. Billington was not well-liked aboard the Mayflower and had a reputation for being crude, foul-mouthed, and a “knave.” He and his family were not part of the Separatist Puritan group who made up a large percentage of the ship’s passengers; rather, he was along for the ride to escape creditors. He was Catholic, which rankled the Puritans’ sensibilities. In addition, he was involved in an unsuccessful mutiny during the voyage. Needless to say, he didn’t make many friends on the 66-day jaunt across the big blue. Once on land, Billington continued to be a problem. He balked at the idea of military service, was implicated in an anti-Puritan plot (though he wasn’t charged), and according to the Governor William Bradford, the entire Billington family continued to be “one of the profanest families” in Plymouth. This year John Billington the elder (one that came over with the first) was arraigned; and both by grand, and petty jury found guilty of willful murder; by plain and notorious evidence. And was for the same accordingly executed. This as it was the first execution amongst them, so was it a matter of great sadness unto them; they used all due means about his trial, and took the advice of Mr. Winthrop, and other the ablest gentlemen in the Bay of Massachusetts, that were then newly come over, who concurred with them that he ought to die, and the land be purged from blood. He and some of his, had been often punished for miscarriages before, being one of the profanest families amongst them; … His fact was, that he waylaid a young man, one John Newcomen (about a former quarrel) and shot him with a gun, whereof he died. Billington was the first person in the colony to be convicted of such a heinous crime by a court of law. He was tried by a jury and found guilty, becoming the colony’s first convicted murderer. In September 1630, he also became the first person to be executed by a governing body in North America, dying via public hanging. He likely wasn’t expecting the death sentence. As Hubbard mentioned, most crimes were punishable by whipping or some time spent in the stocks, but the officials in charge either saw the crime as too horrible to get away with or they were tired of Billington’s constant mischief. 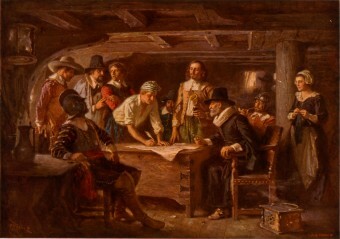 That said, there are other sources, including an English trader by the name of Thomas Morton, who claimed Billington was “beloved by many.” Given that most of the sources of information on the man were written by Puritans who would no doubt be biased against him because he was a Catholic and because he railed against their authority over him, it’s possible that Billington wasn’t the notorious, wilful murderer that history paints him to be. One of the chief among these negative sources, the governor of the colony William Bradford, is known to have particularly disliked Billington nearly from the beginning; things didn’t improve as Billington, with others, are thought to have made attempts to overthrow Puritan rule in the colony. So, in the end, Billington may have murdered Newcomen as described, or it may have been for other reasons. Who knows? It could have even been a hunting accident. We don’t have an account of what happened from Billington himself. Whatever the case, after the death Newcomen, Billington became the first convicted murderer in the New World. The entire Billington family proved to be quite the handful for the Puritans. Billington’s wife, Ellinor, was once confined to the stocks and whipped for slandering a Plymouth man. His older son, John, wandered off when he was 17, a year after the Mayflower landed, and disappeared for five days. He ran into some Native Americans and the residents of Plymouth ran off to “save” him, but he was handed over without any conflict and was unharmed. The younger son, Francis, got into a spot of trouble on the ship when he shot a gun next to a barrel of gun powder which resulted in a fire on the ship (thankfully, the barrel of gunpowder did not ignite and no one was hurt). In addition, after his death, Billington’s granddaughter was whipped after being found guilty of fornication at the age of 22 (admittedly, an extremely common crime in the colony). United States President James Garfield was a descendent of Billington. My family traces its descent from the Pilgrim’s pastor John Robinson. My wife’s, less fortunately, from Mr. Billington. Great article. John Billingston was my 14th Great Grandfather, and his son, Frances, my 13th Great Grandfather. Interesting read! John billington is my grandfather as well. I’m not quite sure what number 15 possibly. What I know from my grandmother -who has traced our family to him – is that he went hunting instead of going to church because people were starving. The other man called him out for it, and in the ensuing argument John killed the man in self defense. Nevertheless, he was hanged(by people he helped).